Here, we report a case of PEN in a 40-year-old female with emphasis on the needs and challenges for diagnosing such lesions as they have to be differentiated from other peripheral nerve sheath tumors. A 40-year-old female reported to the department of oral diagnosis with the chief complaint of growth in left lower anterior region of the jaw since 6 months. On examination, a solitary growth was seen at the attached gingiva on the labial aspect of #31 to #33 region [Figure 1]. The growth was initially small in size and gradually increased to attain the present size of 3 cm × 2 cm. 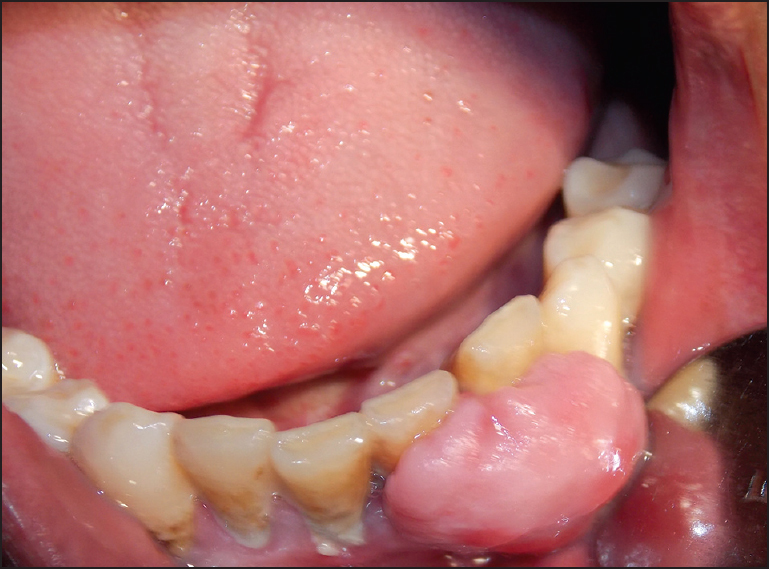 The growth was pale pink in color, pedunculated and roughly oval in shape with normal overlying mucosa and no ulceration. On palpation, growth was nontender and firm in consistency. There were no secondary changes associated with the growth. Rest of the head and neck examination was normal. Radiographic findings (intraoral periapical X-ray) revealed mild widening of periodontal ligament space in respect to #32 and horizontal alveolar bone loss in respect to all associated teeth [Figure 2]. Correlating with the clinical and radiological findings, a provisional diagnosis of fibroma was given. A differential diagnosis of giant cell epulis, pyogenic granuloma, and neural tumor was considered due to the similar clinical appearance and site of occurrence. Routine blood investigations were normal. An excisional biopsy was done under local anesthesia and specimen was sent for histopathological examination. Histopathological examination revealed a well circumscribed encapsulated tumor mass consisting of spindle-shaped cells with wavy nuclei [Figure 3]. The nuclei showed palisading arrangement of the tumor cells with no verocay bodies or fascicular arrangement [Figure 4]. Few nerve fascicles were present in the periphery. Tumor cells did not show any pleomorphism or mitotic activity. 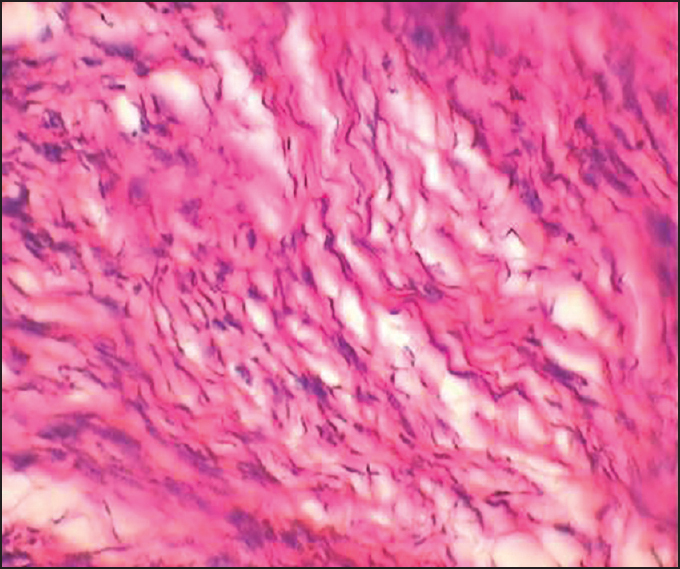 The overlying stratified squamous epithelium was atrophic in nature. Based on the above findings a diagnosis of a nerve sheath tumor was arrived at. The absence of bundles of collagen fibers, giant cells and vascularity with proliferating endothelial cells ruled out the diagnosis of fibroma, giant cell epulis and pyogenic granuloma respectively. 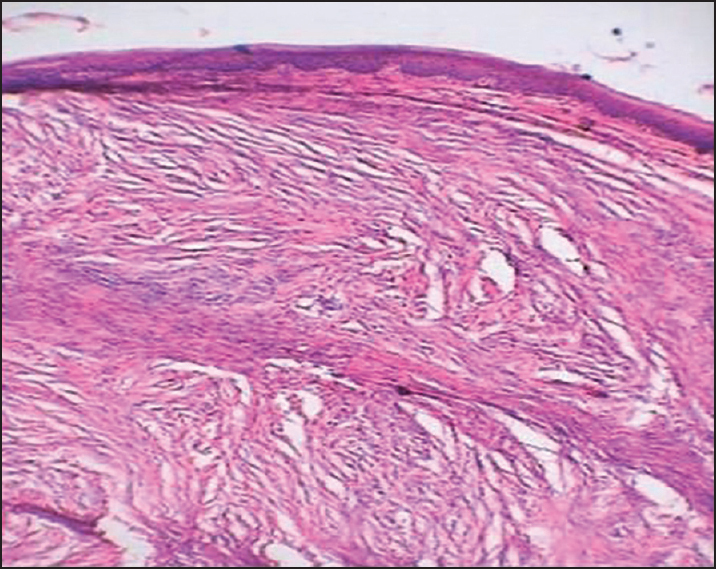 However based on histopathology, neurofibroma, neuroma, schwannoma and PEN could not be differentiated. So to know the exact nature of the mass and to arrive at a conclusive diagnosis, immunohistochemical (IHC) staining was performed with BioGenex, CA, USA, dilution 1:80 kit. IHC analysis revealed that tumor cells stained positive for S-100 and vimentin [Figure 5] and [Figure 6] and negative for desmin and glial fibrillary acidic protein (GFAP) [Figure 7] and [Figure 8]. Based on these findings; a definitive diagnosis of PEN was suggested. Since there are similarities and overlap in features of peripheral nerve sheath tumors; a histologic co-relation along with IHC staining is needed to arrive at a definitive diagnosis. 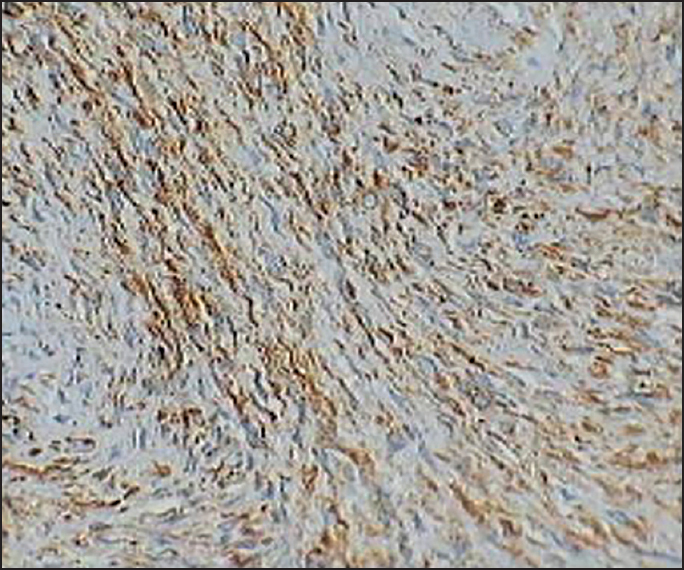 Immunohistochemical analysis of PEN reveals; presence of numerous axons within tumor and cells show a positive IHC reaction for S-100 protein, collagen type IV and vimentin; all of which are consistent with Schwann cell differentiation. , Neurites are neurofilament protein positive and GFAP negative. Axons to Schwann cell ratio is <1:2. 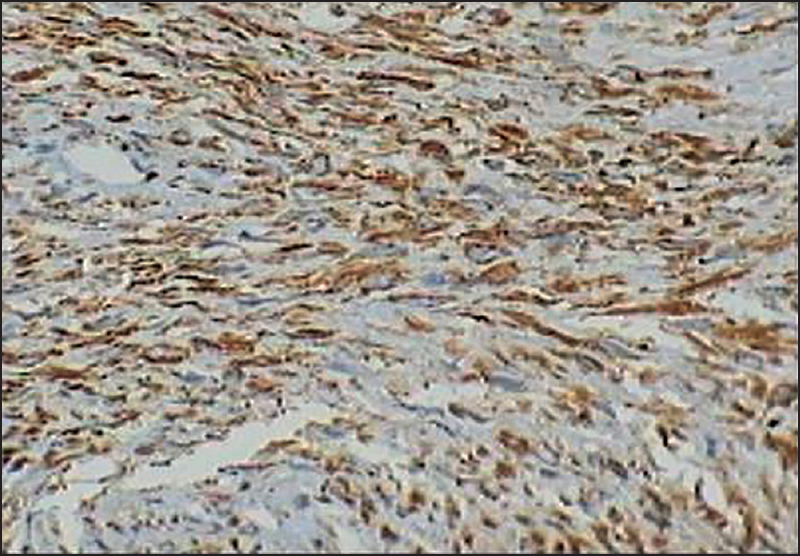 In the present case; IHC staining of the tumor cells was positive for S-100 protein and vimentin and negative for GFAP. Treatment of PEN consists of conservative local surgical excision. The importance of correctly diagnosing these tumors is that a misdiagnosis of such lesions as a neurofibroma or mucosal neuroma may lead to unnecessary clinical concern or patient testing. The present case highlights the perplexity in diagnosing a lesion of peripheral nerve sheath origin. Problems of differential diagnosis concern a wide range of other tumors with the same origin such as the neurofibroma, schwannoma, and traumatic neuroma. IHC analysis serves to be helpful so that a definitive diagnosis of PEN can be made. Magnusson B. Palisaded encapsulated neuroma (solitary circumscribed neuroma) of the oral mucosa. Oral Surg Oral Med Oral Pathol Oral Radiol Endod 1996;82:302-4. Go JH. Benign peripheral nerve sheath tumor of the tongue. Yonsei Med J 2002;43:678-80. Chrysomali E, Papanicolaou SI, Dekker NP, Regezi JA. Benign neural tumors of the oral cavity: A comparative immunohistochemical study. Oral Surg Oral Med Oral Pathol Oral Radiol Endod 1997;84:381-90. Halder C, Sen S, Gangopadhyay A, Bala S. Zosteriform palisaded encapsulated neuroma: An unusual presentation. Indian J Dermatol 2013;58:492. Reed RJ, Fine RM, Meltzer HD. Palisaded, encapsulated neuromas of the skin. Arch Dermatol 1972;106:865-70. Dubovy SR, Clark BJ. Palisaded encapsulated neuroma (solitary circumscribed neuroma of skin) of the eyelid: Report of two cases and review of the literature. Br J Ophthalmol 2001;85:949-51. Fletcher CD. Solitary circumscribed neuroma of the skin (so-called palisaded, encapsulated neuroma). A clinicopathologic and immunohistochemical study. Am J Surg Pathol 1989;13:574-80. Koutlas IG, Scheithauer BW. Palisaded encapsulated ("solitary circumscribed") neuroma of the oral cavity: A review of 55 cases. Head Neck Pathol 2010;4:15-26. Neville BW, Damm DD, Allen CM, Bouquot JE. Oral and Maxillofacial Pathology. 3 rd ed. Philadelphia, PA, USA, Noida, India: Saunders Elsevier; 2009. 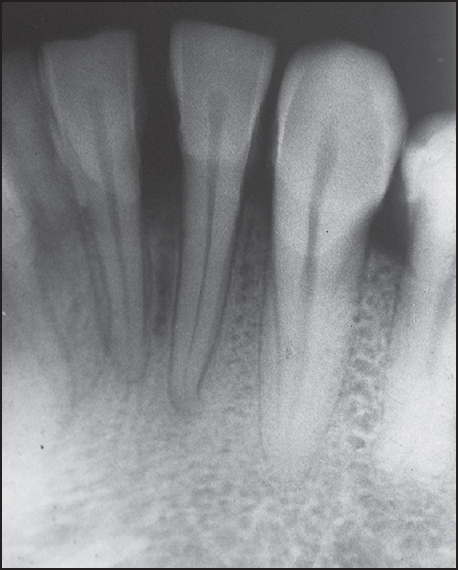 Handa R, Shambulingappa P, Sheikh S, Bansal R, Gupta A. Palisaded encapsulated neuroma: Unusual growth in oral cavity. J Oral Sign 2013;5:41-3. Dover JS, From L, Lewis A. Palisaded encapsulated neuromas. A clinicopathologic study. Arch Dermatol 1989;125:386-9. Dakin MC, Leppard B, Theaker JM. The palisaded, encapsulated neuroma (solitary circumscribed neuroma). 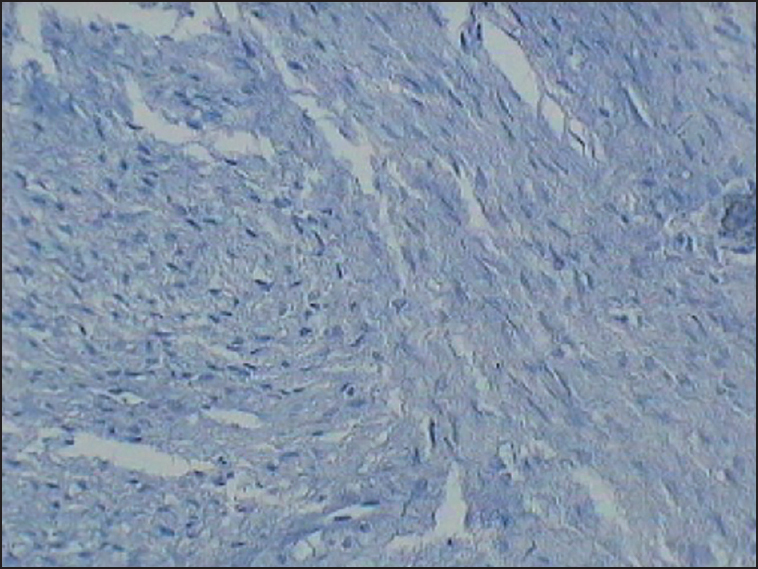 Histopathology 1992;20:405-10. Argenyi ZB, Cooper PH, Santa Cruz D. Plexiform and other unusual variants of palisaded encapsulated neuroma. J Cutan Pathol 1993;20:34-9. Megahed M. Palisaded encapsulated neuroma (solitary circumscribed neuroma). A clinicopathologic and immunohistochemical study. Am J Dermatopathol 1994;16:120-5. Argenyi ZB. 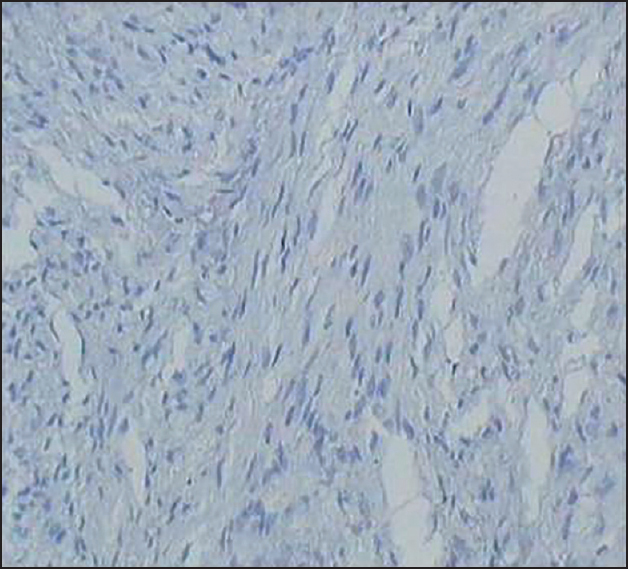 Immunohistochemical characterization of palisaded, encapsulated neuroma. J Cutan Pathol 1990;17:329-35.